Reel Island Casino had been added today to the list of recommend online casinos, this is brand new casino launched this year (2015) they are a new outfit from the UK called Flip Media but come with many years of experience in the industry. The casino is operated by the Caddell Group, they use the White Hat Gaming platform as their source of online slots meaning you are spoiled for choice on slot selection, this also means that they have an e-gaming license in Curacao, and more importantly they also have a valid license from the UKGC which means they welcome players from the UK with no issues. The casino comes with a very bright attractive design, and the navigation is simple on both Desktop PC and Mobile Devices, everything is well laid out and there are numerous game filters making it easy to find your favourite slots. 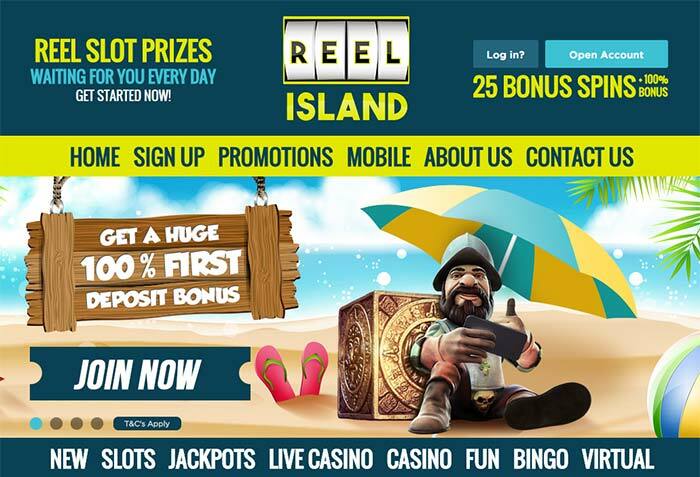 Reel Island offers players a decent Welcome Bonus Package which comprises of 100% Deposit Match Bonus as well as 25 Free Spins on your first deposit which can be used on a variety of NetEnt slots including Starburst, Gonzo’s Quest or Spinata Grande. What Online Slots do they have? 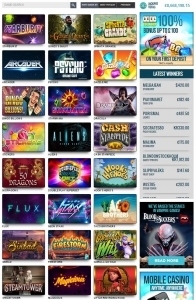 Reel Island Casino has a huge range of slots available to players, there is a full range of NetEnt slots available including the progressives, and great ranges from providers such as Thunderkick, Nextgen, Aristocrat and Quickspin, with all of the most current releases from these developers being added in a timely manner to the casino. Thankfully there are numerous filters available in the slots section allowing players to filter games by useful things such as game provider, most popular, most recent, A-Z and a simple search box if you already know the slot title you wish to play. There is also a regular casino section and live casino if you fancy your chances on the casino tables games. 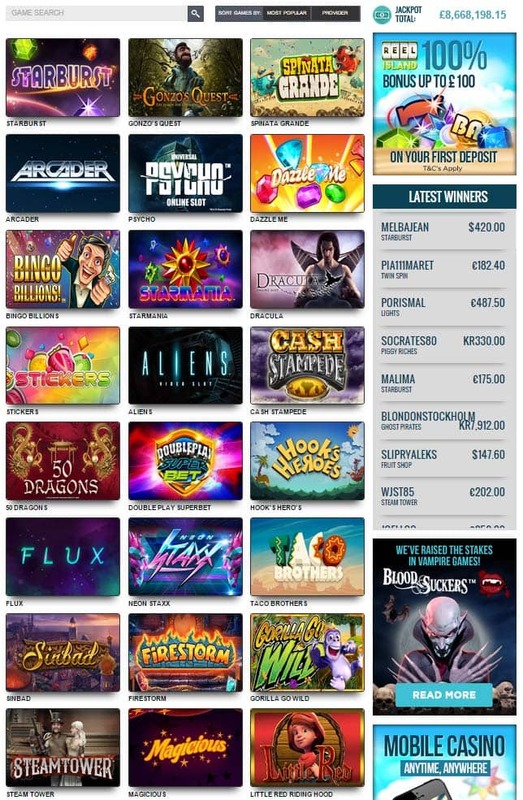 New players signing up to Reel Island Casino will have access to a first deposit bonus of 100% up to €/£100 as well as 25 Free Spins which can be played on any of the following Starburst, Gonzo’s Quest or Spinata Grande. It should be noted that the wagering requirements on the first deposit Welcome Bonus are quite high at 35 x Bonus + Deposit, the regular bonuses after this point are much lower though at 35 x Bonus only. Similarly, the wagering requirements for the free spins are set at 35x Winnings. There is also a small list of slots that contribute lower to the wagering requirements, so make sure you don’t decide to grind out wagering requirements on them, all the bonus terms and conditions are easy to locate on the Reel Island website. The casino does however have a full schedule of regular promotions already in place, with new daily offers and weekend promotions, so plenty of good offers including reload bonuses, and a loyalty points scheme to look forward too if you choose to play there regularly. Customer service is available at Reel Island 24/7 via a live chat function, they also offer an email contact should you prefer this method, but generally live chat will be the best method for resolving any issues that you have at the casino. All of the regular payments methods are accepted including Mastercard, Visa Debit, Visa, Neteller, Skrill, Trustly as well as several more options.